There are countless ways to record an electric guitar. While some of these do not really work for distorted guitars, you have even more choices when you want to record a clean guitar: you can plug it directly into the mixing desk, or use a DI-box before. Then there are special recording solutions like digital or analog pre-amps that also emulate the influence of the guitar speaker or even the microphone. And of course there is still the old-fashioned way – using a guitar amplifier and one or more microphones. Here the guitar is plugged into on of the phone-jack inputs of a mixing desk. These are normally designed for line-level instruments like keyboards or pre-amps. The lower volume of the guitar is no problem, but a guitar expects an input impedance (resistance of the input) of a few hundred kOhms. A normal line in has only something like 10 – 100 kOhms however. This circumstance leads to a strong reduction of the guitar pick-up’s resonance peak. This is the frequency at which the pick-up is loudest. It is a result of the pick-ups electrical values like the number of windings and the resistance of the wire of its coil. Typically the frequency is somewhere in the range from 2 – 7 kOhms, and the effect is more pronounced with a single coil pick-up – a reason of the characteristic sharp treble you associate with a Fender guitar. With a too low input impedance these frequencies are dampened and the sound easily becomes a bit muddy. One way to avoid the problem described for version #1 is to use a so-called DI-box (DI for direct injection) – a little device that has a proper input impedance and is plugged between the guitar and the mixing desk. There is another possibility to have the same effect that does not require to buy anything new: use any of your guitar effects as a replacement for the DI-box. A guitar effect has of course a proper input impedance for a guitar, and this is even true if the effect is switched off (with exception of a few effects with a so-called true hardware bypass). You can hear on the video that the sound is much clearer, you have more treble. This is the same setup as in version #2 with exception of a different cable between the guitar and the effect. Here I used a long guitar cable (9m = 30 ft. ) instead of the 3m (10 ft.) cable used on the other versions. The sound is darker. This effect has nothing to do with the quality of the cable or its internal resistance. Instead it results of the capacity each shielded cable has. It acts like a capacitor which changes the resonance frequency of the pick-up (see version #1). 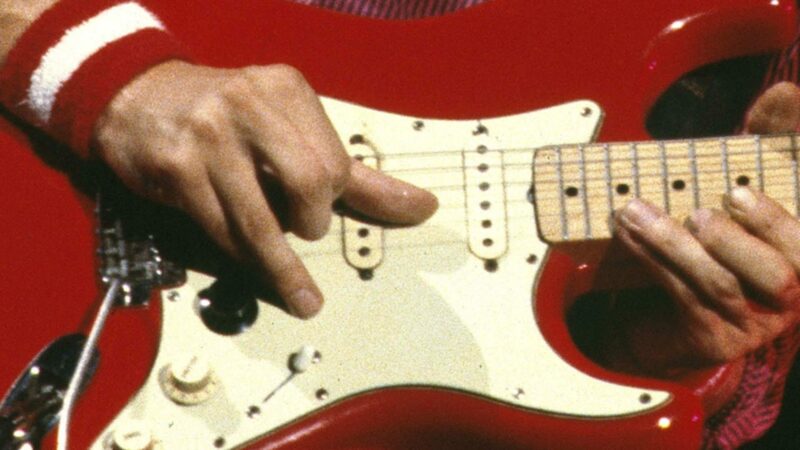 For example, a Fender Stratocaster pick-up has a resonance frequency about 6 kOhms, but if you connect a capacitor to it, this frequency moves down to maybe 4 kHz (with a small capacitor of a few hundred pF) or maybe even to 2 kHz with a slightly bigger capacitor. You can easily measure the capacity of a guitar cable and you will find values up to more than 1nF ( = 1000 pF) . The capacity has to do with the size of the cable: if all other dimensions are the same, a cable with 20 ft. will have a capacity twice as high than a cable with 10 ft. – no matter if both cables are low or high quality. The POD by Line 6 was one of the first digital amp emulators. These convert the guitar signal into digital data and use mathematical algorithms to imitate the effect of a vacuum tube, a guitar amp circuit, or even a guitar speaker. Note that the picture was taken later and does not show the setting used on the recording. The Tubeman by Hughes & Kettner is an analog device that uses a real tube. It has gain and volume controls plus different tone controls and allows a great variety from clean to heavily distorted sounds. It has outputs for a mixing desk or a guitar ams (with or without speaker simulation). Note that the picture was taken later and does not show the setting used on the recording. The heading says it all. In this case a Music Man guitar amp with a Shure SM57 microphone. The SM57 does not cost much and is something like a standard for recording guitars. Some guitar amps have a direct out. With this jack the signal from the pre-amp stage can be routed into another power amp or into a mixing desk. However, the guitar speaker is important to shape the tone, it actually cuts all frequencies above something like 6 kHz. As the speaker is missing now, you get a very crisp but sometimes rather harsh sound. Especially for distorted guitar sounds, this almost never leads to good results. What does it sound like in the mix? The next video sequences demonstrate how some of the previous setups sound in a complete mix. All the raw sounds have been slightly EQ’ed, and some compression, reverb, and delay has been added. The video is in youtube high quality. If you have problems with bandwidth, you can watch it in normal quality directly at youtube, click here. Which version sounds best to you in the mix? hi ingo! thank you always for this amazing site! lovely work so useful! may i ask for a post explaining what to do to record electric guitar with the laptop? every step from guitar to cubase (or other softwsre), what to do to avoid the delay between what you play and what you hear…. too complicated? This is something I can put on my list. Hi Ingo, I have a question about the recording with a mic: where do you plug in the mic cable? Directly into a pc, or in a mixing desk, or what? You need a mic (pre-)amplifier, or a mixing desk to plug in a mic. The mic input of a normal soundcard is somewhat useless as it is normally too noisy, and you cannot adjust the gain properly.